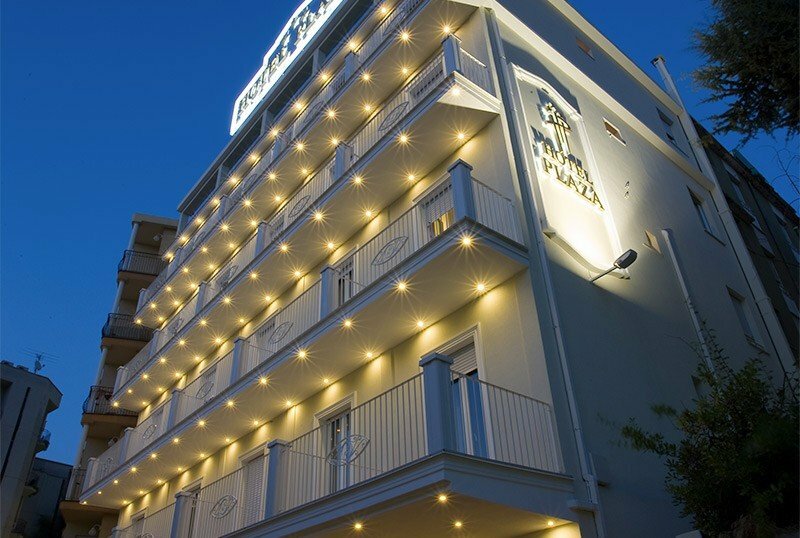 Hotel Plaza , 3 stars in Gabicce Mare, has comfortable rooms, WI-FI connection throughout the entire hotel, secure outdoor parking with free shuttle, bikes available. Once a week, it offers its customers a boat trip. The hotel is located in a quiet area of Gabicce Mare, a short distance from both the sea and the town center. The rooms are all equipped with balcony, air conditioning, heating, ceiling fan, free WI-FI, satellite LCD TV, safe, direct dial telephone and private bathroom with hairdryer, shower and complimentary toiletries. Rooms with sea view are available. FAMILIES : interconnecting rooms with two bathrooms are available on request. Garden, terrace with solarium and sun beds, free bicycles, living room, TV room, small library, bar, 24-hour concierge, lift, welcome drink, weekly aperitif and theme nights. The hotel offers guests every week a boat trip. PARKING : free and guarded outdoor with free shuttle service, parking for weekend stay only for a fee. CONVENTIONS : beach, amusement parks (Cattolica Aquarium, Oltremare, Aquafan, Italy in miniature), "Riviera Golf" of San Giovanni in Marignano, shuttle service, free boat trips. BREAKFAST : sweet and savory buffet with desserts prepared by the chef. LUNCH AND DINNER : three menus to choose meat or fish, followed by a buffet of vegetables and salads. Water, local wine and soft drinks are included with meals. New 2019 possibility to have lunch on the beach with fresh and light menu at the bar / restaurant Tom (except Saturday, Sunday and holidays). VARIATIONS : menus dedicated to children. In hotel : outdoor playground area, indoor play corner, pediatrician on request and for a fee. At meals : baby menu, baby food, high chairs at the table. Once a week, the hotel offers guests a sightseeing tour in the most picturesque bays in the area. Moreover, thanks to the collaboration with the Rivieragolf of San Giovanni in Marignano, Hotel Plaza will be able to play on an 18-hole course plus 9 executive golf courses and dedicate itself to wellness in the Rivierabeauty center. The hotel has an agreement with the beach n. 26 Roberto and Olga, which offers many services including: entertainment and entertainment, relaxation area and WI-FI. Listenpreise verstehen sich als min. und max und kann je nach dem gewünschten Zeitraum variieren. Halbpension: - 4,00 Euro vom Preis der gewünschten Behandlung abzuziehen: Vollpension oder All Inclusive Pension. - Wenn Sie nicht ankommen, verlieren Sie die gesamte Anzahlung. Es kann dem Kunden für einen zukünftigen Aufenthalt der gleichen Dauer zur Verfügung stehen, der mit der Verfügbarkeit des Hotels vereinbar ist. - Vorzeitige Abreise: Für Kunden, die ihre Abreise erwarten, werden die Kosten für eine Übernachtung mit 3 Übernachtungen pro Person in Rechnung gestellt, wie sie "in den Provinzialsammlungen im Tourismusbereich der Industrie- und Handelskammer der Landwirtschaft in Pesaro und Urbino" vorgesehen sind. Families with children up to 4 years of age: contact us.